I originally entered the 110km race. I figure that I'd already done a 55k race, so 110k would be a logical next step. 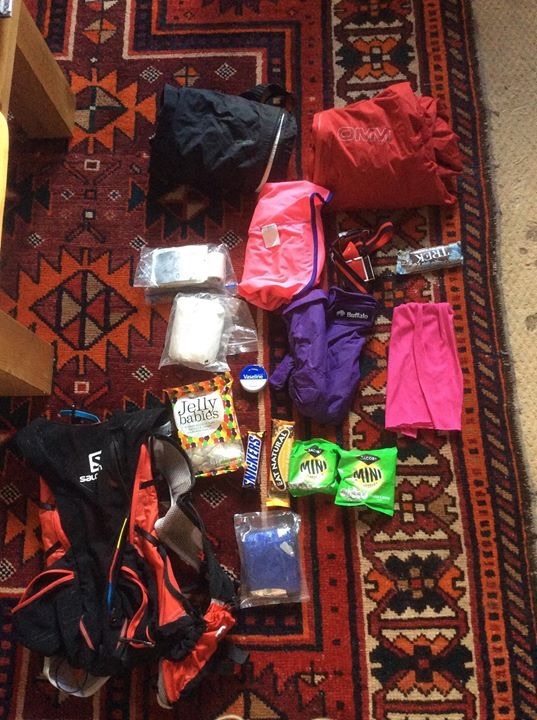 My brain chose to ignore the fact that the last 55km was 2 years ago and it wasn't any where near the level of difficulty of a Lake District race. I early must have my internet and credit card privileges revoked, or at least supervised. But it all got a bit too much, psychologically for me, plus a bit of an injury. So in March I dropped down to the 55km. In May we tried to walk the route of the 55km. We decided to walk it over 3 days: Ambleside-Grizedale Hause; Grizedale-Langdale; around Langdale and back to Ambleside. So again with the big rucksack and all the worldly possessions (yes we did decide to camp again). Once again the weather was awful. While we didn't exactly abandon this time, we did 19m to Grasmere on day 1 where it was so wet we couldn't face camping and went door to door until we could find a hotel that had space. Then, still in the rain, we walking in to Langdale then directly back to Ambleside. But again good strength training and another opportunity to check out the paths and visualise shuffling along them in June. So after a bunch more training it was finally race weekend. We headed north on the Friday, thinking we'd have a nice chilled afternoon in Ambleside...Then the M6 happened. It took 6 hrs to do the usual 2.5 hr drive due the the closure of the motorway. We started to go a little stir crazy having gone 2miles in 2hrs. Luckily we did have snacks and water in the car in order to stay hydrated and carbed up. Having finally made it to the Lakes we got checked in to our B&B, had a little wander around the shops to loosen up and purchase additional last minute kit (see next photo) and then get some food. Then we had a little wander to the start to check think things out. 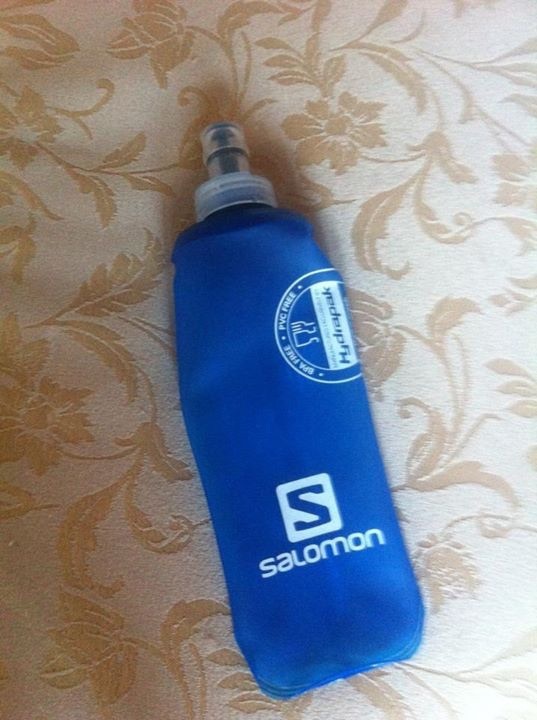 World's most expensive bottle and all because the kit list called for 100ml emergency water! There were loads of people who looked like they were doing the 110k race. All of whom looked like they needed to eat more pies and cake, but all of whom had my upmost respect for the training and commitment that I didn't have. Feeling nervous at the start. I couldn't eat much at breakfast (having made a bit of a fuss about having as much porridge as possible). But had some rice krispies, toast and a few spoonfuls of porridge. But I was well hyrdated, a good job given how warm it was. I think I was confident that I could complete the distance, despite only having done 22m (with 1500m of climb, in 6hrs up in the Peak District) as my longest run. But all I really wanted at the end of the day was to finish in the cut off, even if it meant being last (as I was in my last ultra). So having left The Boy to line up in the start pen I got a bit more nervous, but as the winner of the 110km came in just before we finished, I got inspired by his amazing feat! 110km, over 4000m of ascent and all in 10hrs45. Absolutely stunning! If I could do half that in anywhere near that time I'd be happy. It was warm, it was sunny, it was a beautiful day and I was about to take on a bit of an adventure in one of my favourite places in the world. What's not to like. Even if it hurts! And we were off (taken by The Boy). What amused me was that we all started walking about 300m later as the was a hill up into central Ambleside. I love that! It's all about conserving energy! Phew!!! It was HOT!! I made it to Grasmere, 20m in in about 5 hrs. The first 4m uphill to the Kirkstone pass were hard, but I did it in under an hour, which I was super please with. Had a few crisps and jelly babies at the feed station with some water, then it was a beautiful descent down into Patterdale, where I could actually run. This path (Kirkstone to Patterdale) is awesome, a bit of easy running and a bit of technical path. A quick stop at the feed station in Patterdale before the climb to Grizdale Hause. Steep climb out of the village = a nice walk! Followed by a nice run/shuffle/walk on some great trails up Grizedale Beck. It was here that I picked up a buddy who I would run with on and off for with until the finish. Unfortunately he'd had a fall and had a sore ankle. I paced him up to The tarn and we plodded down into Grasmere together. I have never been so glad to see a cup of tea in my life. A bit more food consumption (crisps, shortbread, jelly babies) in the feed station at Grasmere before heading back into the sun. So, next up was the climb over Silver Howe and then down into Langdale. The view from Silver Howe back over Grasmere and Rydal water was stunning, blue sky, fluffy clouds and green trees. The lakes looked pretty good for a swim! The descent into Langdale was steep and by this stage the bottoms of my feet were starting to hurt, a lot. So I stopped for a sock change and a bit more Vaseline. The Boy had come to meet me unexpectedly and it was great to see him. He took this photo of me tottering off towards little Langdale. The sock change was nice, but I think a little late. As the feet really didn't get better, but i. Fairness they didn't get much worse! I picked my buddy Dave up again. Man, that was tough! The 7m round little Langdale to the final feed station at the Stickle Barn was HARD, with a capital huh. Feeling sore footed, tired leged, I'd run out of water (despite topping up at the previous feed station) and felt a bit low on energy. Luckily I picked up Dave again and had a nice chat with another bloke (doing his first ultra...having only taken up running a year ago! Amazing!!!). But The Boy was at the Stickle Barn waiting for me, which was ace! So he got a snog and a sweaty hug (not sure he appreciate it!). Anyway, I knew I needed to eat, but really didn't fancy it, so I forced down some crisps, half a ham sandwich and a cup of tea, filled up with water and then headed on for the final 7m or so. It looks like I was running here with about 6m to go, but really it was just posing for the camera! Feet were super sore by this stage, so another sock and Vaseline change was necessary shortly after this. My feet were very sore and my legs had started to really stiffen up. I kept attempting to "run" but neither legs nor feet would allow it, so I resorted to walking as fast as possible. Approaching the final 400m, coming down the final hill from loughrigg. That's my buddy Dave (in red) and a guy who'd done the 110km race (I'm rubbish I didn't get his name!). Was tottering quite a lot by now! We all were. But we still managed a smile for the camera. Given that I was aiming for anything under the cut-off (even 1 second would have done) I was super pleased with 10:17. Oh, and I'm always happy about a nice bit of bling. And this was a nice bit of bling! Taken by The Boy, so I blame him for it being won by, rather than because I could no longer stand! Am amazing day, hard work ( I still couldn't walk properly the following Wednesday! ), but worth it. Well organised, well supported, awesome marshals and feed station people. Thanks to the Ultimate Trails team for making it happen.